CI Clarity works by reacting with and permanently neutralizing corrosive gases, both inside and outside the containment, and will last 3-15 Years depending on material style, gauge, and the aggresiveness of the environment, though temperature will not affect its ability. CI Clarity also acts as both a fungus and a bacteria inhibitor. All this and yet Corrosion Intercept® Clarity does not use volatile chemicals and does not leave deposits on products. In fact as #4 plastic, CI Clarity is fully recyclable and even breaks down to polymer dust in a landfill which, along with its reusability, means its carbon footprint is low. Corrosion Intercept® Clarity is perfect for light industrial application, museum, archival, and retail applications. CI Clarity is nonvolatile, clean and safe protection. 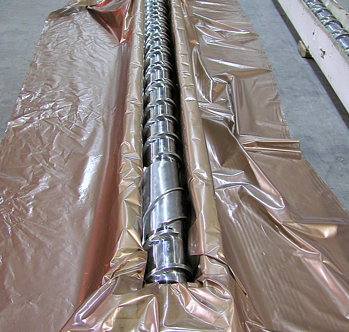 Corrosion Intercept® Clarity is a transparent polyethylene or polystyrene packaging material or a coating substrate. Corrosion Intercept® Clarity changes color as its corrosion protection abilities wane, i.e. the color change is a saturation indicator. It can easily be used to protect products when in-process. Available as bags, shrouds, sheets, rolls, trays and inserts. Various stock bags and rolls are readily available in 3 mil thickness. Custom gauges and sizes are also available on request. For more information or an MSDS and Specification Sheet please contact us.